The rose garden was designed in 1913 by Brett and Hall, and its structure reflects the romantic taste of the Edwardian era. 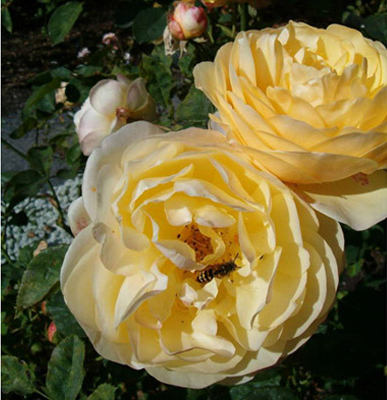 Many of the popular Hybrid Perpetuals and Hybrid Tea roses first planted in it did not prove to be hardy, and very few of them exist in modern gardens. However, one American Pillar in this garden did survive, as did several maintained through cuttings from it. Four of them are located precisely where they appear on the planting plan. Other survivors are Gruss an Teplitz and La France. 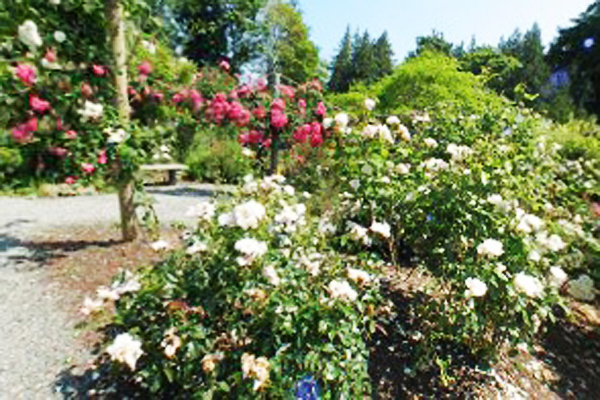 When the garden was renovated in 1997, a lawn, which had replaced some central planting beds earlier, was removed and modern roses donated by Brentwood Bay Nurseries were placed in this area instead. The sundial and bench in the garden are original. Almost a century ago, one of its designers explained how to find it: strolling from the Italian Garden adjacent to the Castle, “the steps leading to the croquet court also lead to the path to the tennis court and beyond to the rose garden…This path skirts a little pond and stream which, with the overhanging trees and flower-carpeted banks, form a particularly pleasing feature.” Franklin Brett, who partnered with George D. Hall in a Boston landscaping firm that completed several early British Columbia gardens, penned these directionsfor the readers of The American Architect in 1916. Today the walled rose garden can be reached by the same route, with the path past the pond now skirting the patio behind the Royal Roads University library. On a warm day the scent of the garden can be caught long before it’s seen. Entering through an unassuming deer gate just past the tennis court and taking a few steps inwards, you’ll be transfixed: roses dangle from above, reach sideways from posts, and rise up from the ground ahead. Big ones, small ones; red, yellow, pink-and-white striped ones… Ramblers, pillars, shrubs… Old ones, new ones: Albas, Damasks, Gallicas and modern David Austins…Every class of rose known to humankind seems to flourish in seclusion here. Why, you might wonder, is a beautiful rose bower concealed so far from its castle? The answer lies in its owners’ wish to mirror British upper-class life during the period when the garden was created. A generation earlier, Victorian rose gardens had held many plants which offered excellent cutting flowers for manor rooms but were ungainly in appearance, so they were located well beyond tightly controlled beds of annuals and other features generally displayed for the interest of guests. The Edwardian gentry who followed in the early years of the 20th Century adored embellishment and decorated their inherited rose recesses with romantic overhanging swags, billowing sprays trained on pergolas and pillars, and sweeping banks of ramblers. 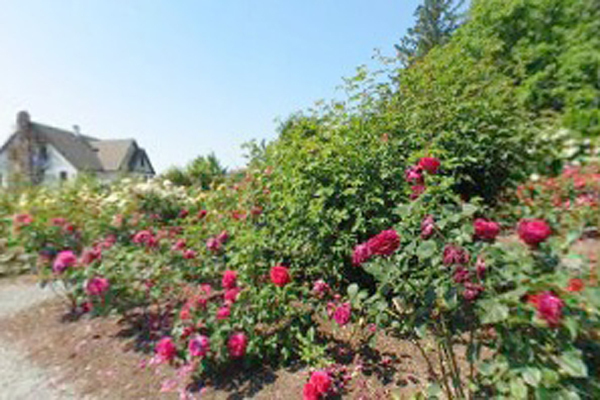 James and Laura Dunsmuir wanted their Hatley property to have the appearance of inherited English grounds which had evolved naturally through the epochs, so its landscape held elements typical of such estates in Edwardian times: a formal terrace adjacent to a mansion, perennial borders, and a distant domain brimming with picturesque, popular contemporary roses. Today, gardener Greg Higgs, under the leadership of head gardener David Rutherford, manages Hatley Park’s rose garden. It contains a broader range of roses than when it was first created. The 1913 planting plan of Brett and Hall housed in the university archives reveals an emphasis on the Hybrid Perpetual, Hybrid Tea and Wichuraiana Ramblers then in vogue. While the structured formality of Edwardian gardens could be timeless in quality, many of their typical roses were not favoured with longevity. For instance, a large number of the Hybrid Perpetuals in the Hatley Park design do not exist in modern gardens. As well as being awkward in appearance, they were susceptible to disease, and their colour range was limited: a visitor walking the paths of the original Hatley Park garden would have seen clouds of maroon, dark red, pink and white flowers emanating from its Hybrid Perpetuals, with an occasional touch of yellow or orange provided by the other classes. 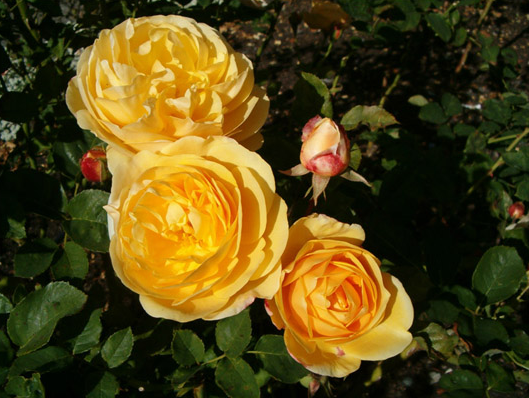 In addition, in spite of their name (Perpetuals) they were not truly “remontant” – they bloomed and rebloomed mainly in June and July, whereas many other roses continue into the fall season. When they renovated the Hatley Park rose garden in 1997, Rutherford and Higgs realized it would be impossible to fully return to the 1913 design. Although they retained its egg-shaped outline with a main path running parallel to a defining outer wall, they introduced a variety of different plants. A central lawn that had replaced rose plantings at some point in the past was removed; healthy soil was dug into the ground and a team of gardeners created new beds. Brentwood Bay Nurseries donated over two hundred plants, including some David Austins, bred in England in recent decades to combine the strengths and scents of hardy old roses with the remontant nature of modern hybrids. Along the garden’s perimeter are heritage roses from antiquity to more recent centuries, including such notables as Rosa gallica var. officinalis (also known as the Apothecary’s Rose, put to medicinal uses from ancient times onwards) and R. `York and Lancaster’ (the latter dating from approximately 1550, and representing the two great English families whose battles culminated in the establishment of the Tudor dynasty). One rose from the Brett and Hall planting design, along with others maintained through the replanting of cuttings taken from it, has survived from the start – it’s a R. `American Pillar,’ a lovely rambler developed in 1902. Four American Pillars are now located on the ground precisely where they appear in the plan, two of them beside a gate into the greenhouse area, and two near an exit to the Japanese Garden. Also reflected both on the design and in the garden itself are R. `Gruss an Teplitz’ and R. `La France,’ although neither are original plants.